Objectives Obesity is suggested to be a risk factor for knee osteoarthritis (OA). This meta-analysis aimed to examine the relationship between body mass index (BMI) and the risk of knee OA in published prospective studies. Studies reviewed An extensive literature review was performed, and relevant studies published in English were retrieved from the computerised databases MEDLINE, EMBASE and Cochrane. Methods The effect estimate (RR or HR) and its 95% CI are investigated on the basis of the evaluation of differences of knee OR risk in overweight or obesity versus those with normal weight. Category-specific risk estimates were further transformed into estimates of the RR in terms of per increase of 5 in BMI by using the generalised least-squares method for trend estimation. Studies were independently reviewed by two investigators. Subgroup analysis was performed. Heterogeneity and publication bias were assessed. Data from eligible studies were extracted, and the meta-analysis was performed by using the STATA software V.12.0. Results 14 studies were finally included in the analysis. The results showed that overweight and obesity were significantly associated with higher knee OA risks of 2.45 (95% CI 1.88 to 3.20, p<0.001) and 4.55 (95% CI 2.90 to 7.13, p<0.001), respectively. The risk of knee OA increases by 35% (95% CI 1.18 to 1.53, p<0.001) with a 5 kg/m2 increase in BMI. Subgroup analysis showed that obesity was an independent predictor of knee OA risk regardless of the study country, sample size, gender proportion of participants, duration of follow-up, presence of adjusted knee injury and assessed study quality above or below an NOS score of 8. No publication bias was detected. Conclusions Obesity was a robust risk factor for knee OA. Professionals should take a possible weight reduction into account for the treatment of knee OA whenever a patient is significantly overweight. We applied random-effect models based on the heterogeneity of the true effects distribution, which avoided the bias of overstating the precision of findings in fixed-effects models. A limitation of the current study was the small number of studies involved, with limited numbers of participants. This reflected the paucity of high-quality clinical trials that addressed this research topic. We conclude that all patients with osteoarthritis should be treated with caution. There is still a considerable need for more high-quality studies assessing adiposity using parameters on body mass index only. Knee osteoarthritis (OA), which is a degenerative disease, is the most common form of arthritis in the knee.1 Knee OA is related to ageing, articular cartilage obesity, fatigue, trauma, joint congenital abnormalities and joint deformities caused by many factors such as degradation of injury, under joint margins and subchondral bone reactive hyperplasia.2 Clinical manifestations of knee OA are slow development of joint pain, tenderness, stiffness, joint swelling, limited mobility and joint deformities. There were 20 million individuals suffering from knee OA in the USA, and this figure is expected to double over the next two decades.3 ,4 Knee pain was reported by up to a half of the individuals aged over 50, among which severe and disabling knee pain accounted for approximately 50%.5 The high prevalence and substantial impact on quality of life of knee OA calls for more high-quality research in this area. An in-depth literature search was performed using the keywords ‘obesity’ OR ‘weight’ OR ‘body weight’ OR ‘body mass’ OR ‘body mass index’ OR ‘anthropometric’ OR ‘anthropometry’ OR ‘adiposity’ AND (‘arthritis’ OR ‘osteoarthritis’ OR ‘OA)’ in various combinations. The computerised databases PubMed, EMBASE and Cochrane were searched to identify eligible studies in English-language journals before August 2014. We also searched the relevant references in the retrieved studies and reviewed articles from the bibliographic database. The corresponding authors in some studies were contacted for more information beyond that in their published articles. All prospective studies that explored the association of obesity and risk of knee OA were considered eligible for the analysis. Two investigators (Zheng Huaqing and Chen Changhong) independently assessed the articles for relevance. Articles that met the following criteria were excluded: (1) cross-sectional studies; (2) a standardised effect size could not be calculated. (3) BMI were categorised according to the WHO (normal weight: BMI of less than 25.0 kg/m2; overweight: 25.0–29.9 kg/m2 of BMI; obese: over 30.0 kg/m2 of BMI) or Asian criteria (normal weight: BMI of less than 23.0 kg/m2; overweight: 23.0–24.9 kg/m2 of BMI; obese: over 25.0 kg/m2 of BMI) of the elderly.14 It was because this meta-analysis was performed mainly using the data from published studies that the need for institutional review board approval was waived. The Newcastle-Ottawa-Scale (NOS)15 was used to assess the quality of each article. The NOS contains eight items, categorised into three dimensions including selection, comparability and, depending on the study type, outcome (cohort studies). For each item, a series of response options was provided. A star system was used to allow a semiquantitative assessment of study quality, such that the highest quality studies were awarded a maximum of one star for each item with the exception of the item related to comparability that allowed the assignment of two stars. The NOS ranges between zero and nine stars. All articles were first de-identified (article title, author names, journal name and year of publication) before selection. The abstracts of the articles were independently reviewed by two of the authors (Zheng Huaqing and Chen Changhong). The data were filtered and input into a standard electronic form. Any discrepancies were resolved by discussion until a consensus was reached. If there was no consensus, the principal investigator (Zheng Huaqing) would make the final decision on the eligibility of the study and data extraction. Data management and analysis were performed by using the STATA software (V.12.0; Stata Corporation, College Station, Texas, USA). We examined the relationship between BMI and the risk of knee OA on the basis of the effect estimate (RR or HR) and its 95% CI published in each study. A random-effects model was used to calculate summary RRs and 95% CIs for overweight or obesity compared to normal weight individuals. We then transformed category-specific risk estimates into estimates of the RR associated with every 5 kg/m2 increase in body mass index (BMI) by using the generalised least-squares method for trend estimation. These estimates were calculated assuming the presence of a linear relationship between the natural logarithm of the RR and increasing BMI. The value assigned to each BMI category was the midpoint for closed categories and the median for open categories (assuming a normal distribution for BMI). We combined the RRs for each 5 kg/m2 increase in BMI by using a random-effect meta-analysis. Subgroup analyses were conducted to investigate the impact of the study country, sample size, gender proportion of participants, duration of follow-up, presence of adjusted knee injury and assessed study quality above or below an NOS score of 8 on the pooled effect sizes. We also performed a sensitivity analysis by removing each individual study from the meta-analysis in order to study the influence on the meta-analysis of each study. All reported p values were 2-sided, and p values <0.05 were considered statistically significant for all included studies. A total of 972 abstracts were initially selected through database search and citation tracking, and 926 articles were excluded because they failed to meet the criteria. 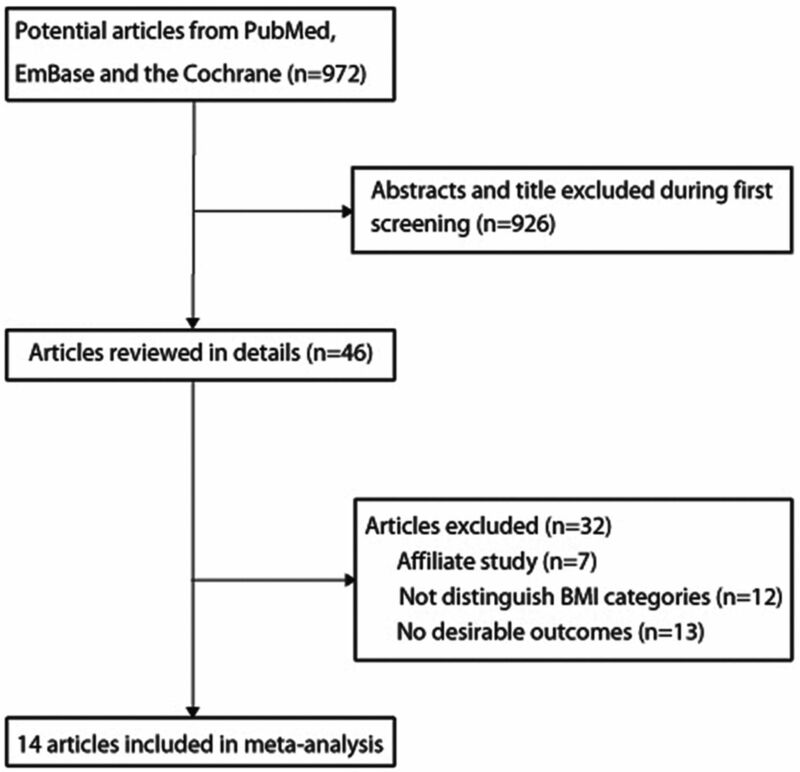 For the remaining 46 articles, 7 were affiliate study, 12 did not have comparison data of different BMI groups and 13 had no desirable outcomes to calculate effect sizes. The results of the study-selection process are shown in figure 1. In addition, the baseline characteristics and NOS score of the 14 articles8 ,17–29 selected for our analysis are shown in table 1. Flow chart describing the article selection process. BMI, body mass index. In these 14 prospective studies, 12 were conducted in western countries and 2 were conducted in the Asia-Pacific region. The proportion of males ranged from 0% to 100%; however, the proportion of gender was not a significant predictor of the effect size in this study. Overweight and obesity were significantly associated with higher knee OA risks of 2.45 (95% CI 1.88 to 3.20, p<0.001, figure 2) and 4.55 (95% CI 2.90 to 7.13, p<0.001, figure 3), respectively. The risk of knee OA increases by 35% (RR: 1.35; 95% CI 1.18 to 1.53, p<0.001) with a 5 kg/m2 increase in BMI, which is shown in figure 4. Subgroup analysis showed that the conclusions were consistent with overall analysis based on predefined factors (table 2). Forest plot for the aggregate risk of knee osteoarthritis for overweight versus normal weight. 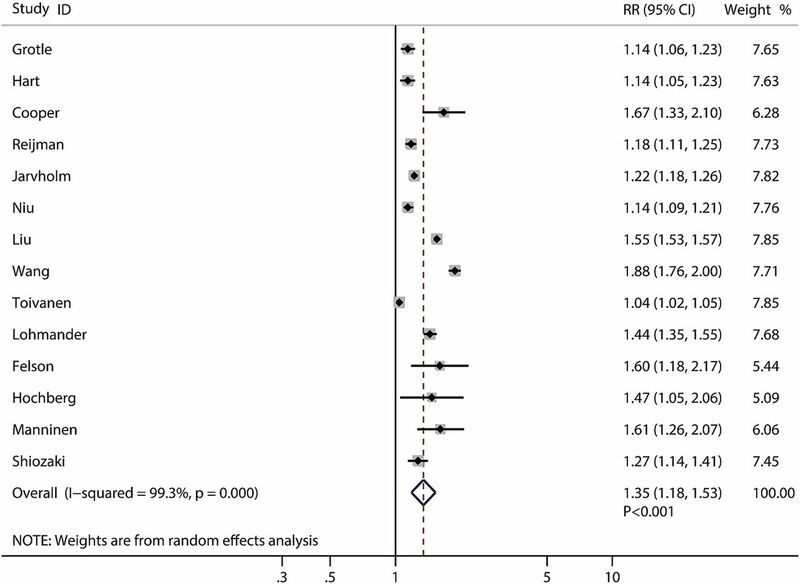 Forest plot for the aggregate risk of knee osteoarthritis for obesity versus normal weight. Forest plot for the aggregate risk of knee osteoarthritis with the increase of a 5 kg/m2 of body mass index. Significant heterogeneity was found in the models of overweight versus normal weight (I2=86.1%, p<0.001), obesity versus normal weight (I2=94.8%, p<0.001) and the increase of knee OA with a 5 kg/m2 increase in BMI (I2=99.3%, p<0.001). Sensitivity analyses were performed for each of the outcomes. No study crossed zero, and removing any study would have no effect on the pooled WMD (data not shown). 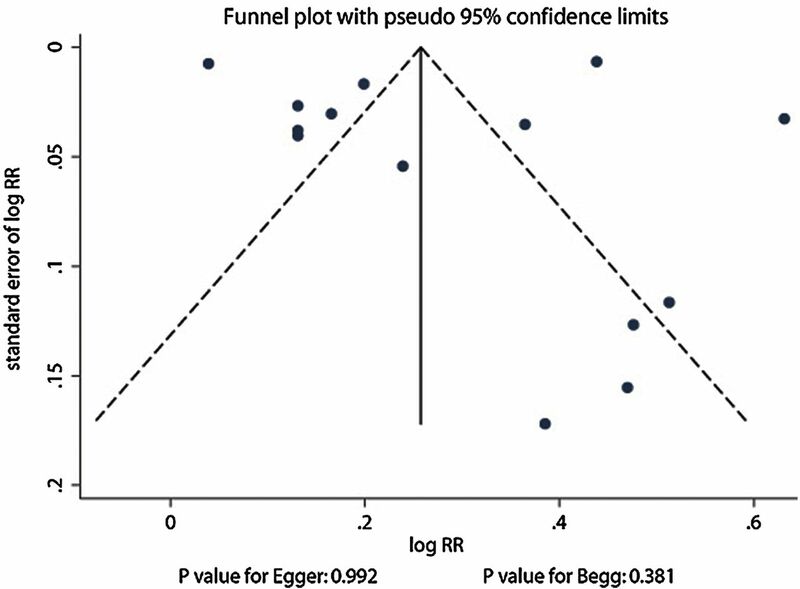 Publication bias was examined by using funnel plots and Egger’s regression test, and results indicated that there was no significant publication bias (p>0.05) in the outcomes of this meta-analysis. Consequently, unpublished data were not evaluated further figure 5. Funnel plot for the assessment of publication bias. 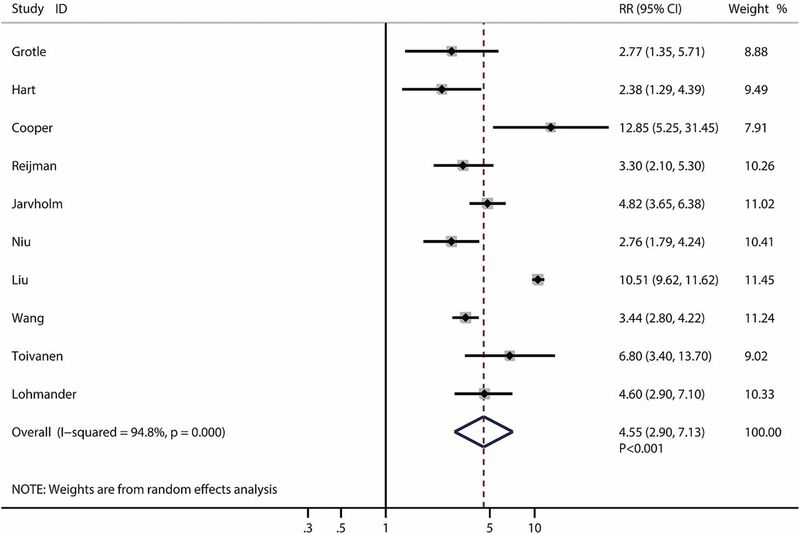 The aim of this meta-analysis was to review relevant prospective literatures in order to identify the risk of being overweight or obese for knee OA. On the basis of the search strategy and inclusion criteria, a total of 14 original studies were selected and assessed. Pooled RR showed that being overweight or obese was approximately 2.5 and 4.6 times more likely to have knee OA than having normal weight. The risk of knee OA increases by 35% with a 5 kg/m2 increase in BMI. Furthermore, obesity was an independent predictor of knee OA risk regardless of the study country, sample size, gender proportion of participants, duration of follow-up, presence of adjusted knee injury and assessed study quality above or below an NOS score of 8. Subgroup analysis showed that the study country and gender proportion were not significant predictors of the effect sizes in this study. According to the findings from our systematic meta-analysis, it is valuable for physicians and policymakers to take obesity as one of the most important risks of knee OA into consideration. The Osteoarthritis Research Society International (OARSI) guidelines strongly recommended that overweight patients with OA with lower limb OA lost weight and maintained a lower weight level.33 We applied random-effect models based on the heterogeneity of the true effects distribution, which avoided the bias of overstating the precision of findings in fixed-effects models. A limitation of the current study was the small number of studies involved, with limited numbers of participants. This reflected the paucity of high-quality clinical trials that addressed this research topic. Generalising the conclusions from this study to all patients with OA should be performed with caution, and there is still a considerable need for more high-quality studies assessing adiposity using parameters beyond BMI only. 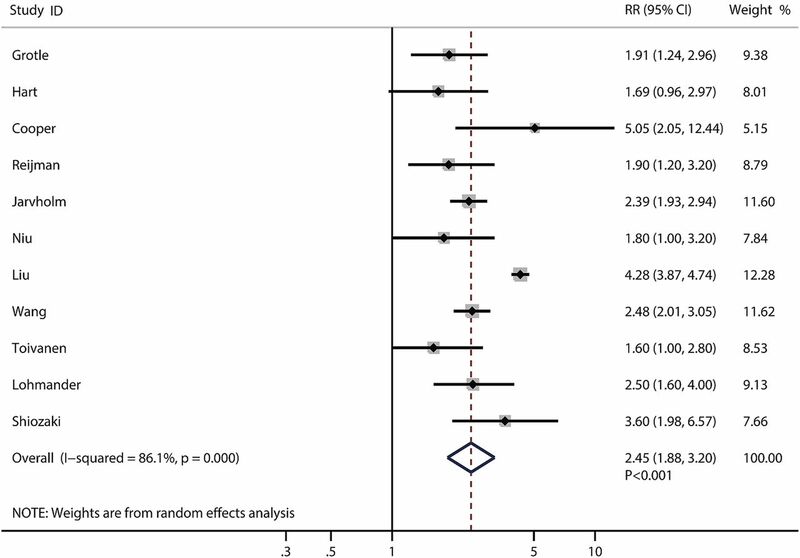 In summary, this meta-analysis confirmed that obesity was a robust risk factor for knee OA. Professionals who treat knee OA should accept a possible weight reduction in mind whenever a patient is significantly overweight.
. Burden of major musculoskeletal conditions. Bull World Health Organ 2003;81:646–56.
. Obesity and knee osteoarthritis. The Framingham Study. Ann Intern Med 1988;109:18–24.
. Improving the quality of reports of meta-analyses of randomised controlled trials: the QUOROM statement. Quality of reporting of meta-analyses. Lancet 1999;354:1896–900.
. The new BMI criteria for Asians by the regional office for the western pacific region of WHO are suitable for screening of overweight to prevent metabolic syndrome in elder Japanese workers. J Occup Health 2003;45:335–43.
. The Newcastle-Ottawa Scale (NOS) for assessing the quality if nonrandomized studies in meta-analyses. 2009. http://www.ohri.ca/programs/clinical_epidemiology/oxford.asp (accessed Aug 2014).
. Bone mineral density and osteoarthritis: data from the Baltimore Longitudinal Study of Aging. Osteoarthritis Cartilage 2004;12(Suppl A):S45–8.
. Overweight, gender and knee osteoarthritis. Int J Obes 1996;20:595–7.
. Obesity and osteoarthritis of the knee in women: results from the Matsudai Knee Osteoarthritis survey. The Knee 1999;6:189–92.
. Weight loss reduces the risk for symptomatic knee osteoarthritis in women. The Framingham Study. Ann Intern Med 1992;116:535–9.
. Monitoring osteoarthritis progression and therapy. Osteoarthritis Cartilage 2004;12(Suppl A):S55–60. Contributors HZ and CC have made substantial contributions to conception and design, acquisition of data, analysis of data. All authors were involved in the writing of the paper and had final approval of the submitted and published versions.